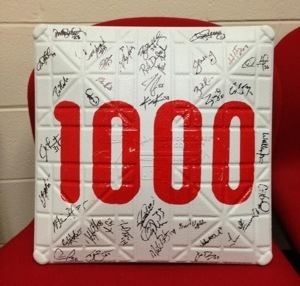 Congratulations to Phillies manager Charlie Manuel on his 1,000th victory as a big league manager. Cole Hamels pushed him over the milestone when he pitched a complete game last night to beat the Braves, 5-1. It was the 96th win Cole has recorded while pitching for Charlie. During his 12-year managerial career he has collected 780 wins with the Phillies (most in franchise history) and 220 wins as the manager of the Cleveland Indians. His clubs have never finished less than 3rd place in their division and Charlie has never managed a full season in the majors where his team failed to win as many games as they have lost. Manuel’s 1,000-824 record is the seventh best of the 35 managers who have joined the club in the last 50 years. He’s the 59th manager in MLB history and one of eight current managers to pass the mark. (Dusty Baker, Bruce Bochy, Buck Showalter, Jim Leyland, Davey Johnson, Terry Francona, and Mike Scioscia are the other active managers with 1,000 wins).